Sod is essentially grass on demand. An ingenious idea, it’s a faster way of having an aesthetically pleasing lawn than laying seed. Sod is more reliable than seed in terms of the probability of it taking root. It also doesn’t require as much care as seed because its water requirements are lower. It’s easy to see why any homeowner would want to buy sod for their new lawn instead of having to wait for the seed to take root and grow. There are pros and cons of both, of course, but if you want a lawn that looks vibrant and even immediately, sod represents an easier way of achieving this. Convenience is often proportional to expense: the more convenient something is, the more expensive it is. As a result, sod is indeed much more expensive than grass seed. The type of sod you choose for your yard will inevitably affect the overall price. If you buy it in large quantities from a sod farm or nursery, you could potentially get a discount. The cost ranges from approximately 30 to 50 cents per square foot, or about $3 to $5 per roll. Fescue is one of the cheapest types of sod while Bermuda is one of the most expensive. Zoysia is only slightly less expensive than Bermuda, and St. Augustine is somewhere in the middle. These are not the only types of sod, but they give a good general impression of the variety of cost. Turf prices do vary by species, region, nursery, and quantity purchased, so be sure to check in with your local turf farm to get a more accurate estimate for your project. The single most important factor when deciding what sod to buy is the climate of the region you live in. Some sods are known as cool grasses, and others are warm grasses. Some are suitable for a yard which gets a lot of sun, while others are only suitable for shady regions. As a homeowner, the last thing you want to do is invest a large sum of money only to find that the grass isn’t the right type for the soil conditions and climate. Do as much research as you can about the best sod for your property before having it installed to avoid a yellowing, dying, or uneven sod lawn. 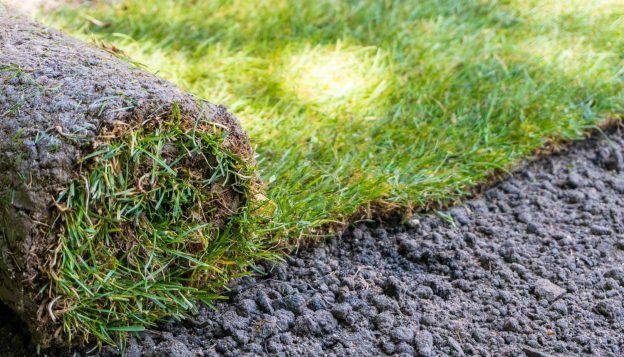 You might want to attempt sod installation yourself, but if you’re going to hire a professional, labor costs will be approximately $30 per hour. For larger projects, it might be best to hire the work out to make sure the sod is installed quickly to ensure the lawn’s health. Assuming that no soil preparation is needed and you intend to use either nursery sod, Bermuda, or Blue Rye mix, the estimated cost of sod installation (including labor) is 80 cents per square foot. The average lawn size all across America is one-fifth of an acre. When you convert this into square feet, it amounts to 8,712 square feet. Thus, the cost of hiring a professional to cover an average-sized yard with sod is 0.8 (80 cents is 0.8 dollars) by 8,712. This amounts to $6,969.60. Thus, it is accurate to assume that having a yard of this size installed will cost around $7000. Our acreage calculator can help estimate the size of your lawn to help get a more precise estimate. Note: Your project may not cost nearly this much, depending on the coverage you require. You might have an average-sized yard that only needs sod installation on a small section, for example. Use our sod calculator to estimate how much you will need. Once you’ve installed the sod, there is one tip that every homeowner should remember. During the first few days and weeks, you should avoid foot traffic on it. It is somewhat fragile until it settles in and the roots develop, so it’s best to be extremely gentle with it in the beginning.